Although it may initially seem that curtain sewing means simply stitching together large pieces of fabric, in fact, it is much more intricate and complicated process. It requires knowledge of many different nuances to correctly create attachment seams, properly handle each type of fabric and implement other details that the specific curtain design requires. 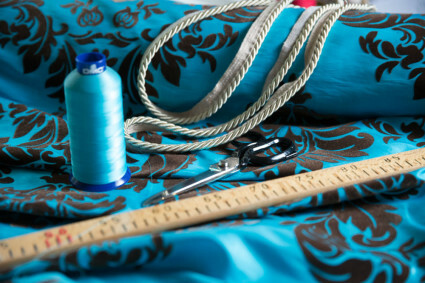 In order to sew curtains, special skill and high quality sewing, ironing and other equipment is required. Our workshop has some of the most modern curtain sewing equipment in Latvia. The curtains ordered by our customers are sewn by professional and experienced specialists with years of experience and specialisation in curtain sewing industry. The skills and knowledge of the specialists, as well as the equipment at out disposal allows us to implement large and complex projects. Sometimes the curtain design also requires especially detailed or specific finish, which may not be implemented by equipment, then our seamstresses do it manually. Contact us in order to learn more about our services. You will say – that’s just a matter of taste. That’s right! We will only offer our professional views, ideas and experience. Design curtains custom – design, sewing curtains and installation. Curtains (aizkari) for the bedroom, living rooms, restaurants and other facilities. Wide fabrics and other decorative materials. Other services – table cloths, cushions, bedspreads, chair covers and other textile sewing. or fill in the communication form!